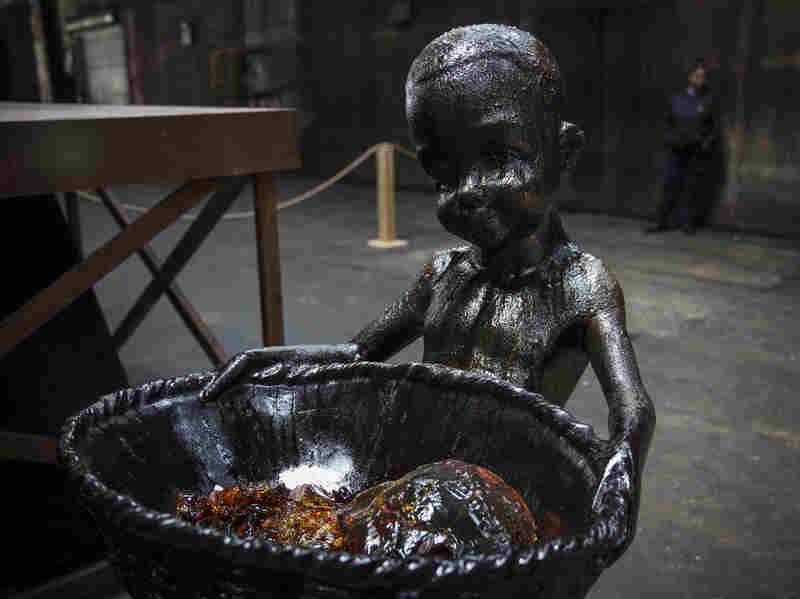 Artist Kara Walker Draws Us Into Bitter History With Something Sweet Walker's latest project is a series of sugar sculptures housed in a former sugar refinery. From far away the works look charming, but up close they tell the ugly story of the Caribbean slave trade. Viewers of Kara Walker's A Subtlety described the sculpture as "beautiful" and "the American sphinx." Another said, "She is so exposed and she's so vulnerable, but at the same time she has some grace and majesticness that is completely unapproachable." Kara Walker was barely out of art school when she won a MacArthur Foundation "genius" grant, in 1997. Back then, her early work shocked audiences in part because her murals looked so charming from a distance. Black paper shadow portraits of colonial figures seemed to dance on white gallery walls; but lean in and you'd find your nose pressed up against images of slavery's horrors — mammies, masters, lynchings and sexual violence. Visitors wait in line for the Kara Walker exhibit on May 10, opening day. The show was housed in a former Domino Sugar refinery. Inside, visitors described the building as "cathedral-like" and "creepy" and said it smelled like a bakery. In other words, Walker is used to filling a room. But this spring she was asked to fill a warehouse — the abandoned Domino Sugar factory in New York. It's about to be leveled to make way for condos and offices, but before it goes, Walker was asked to use this cavernous, urban ruin for something special. Walker took me on a tour of the show a day before it opened. The factory is covered in sugar — it almost looks like insulation or burned cotton candy. "It's a little bit sticky in some areas ..." she said. "There's sugar caked up in the rafters." I was so busy trying not to get molasses on my shoes that when I turned the corner, I was stunned. There in the middle of this dark hall was a bright, white sphinx. The effect is the opposite of those white-walled galleries; a dark space and a towering white sculpture made of — what else? — sugar. "What we're seeing, for lack of a better term, is the head of a woman who has very African, black features," Walker explained. "She sits somewhere in between the kind of mammy figure of old and something a little bit more recognizable — recognizably human. ... [She has] very full lips; high cheekbones; eyes that have no eyes, [that] seem to be either looking out or closed; and a kerchief on her head. She's positioned with her arms flat out across the ground and large breasts that are staring at you." Walker has dreamed up a "subtlety" — that's what sugar sculptures were called in medieval times. They were a luxury confectioners created for special occasions. 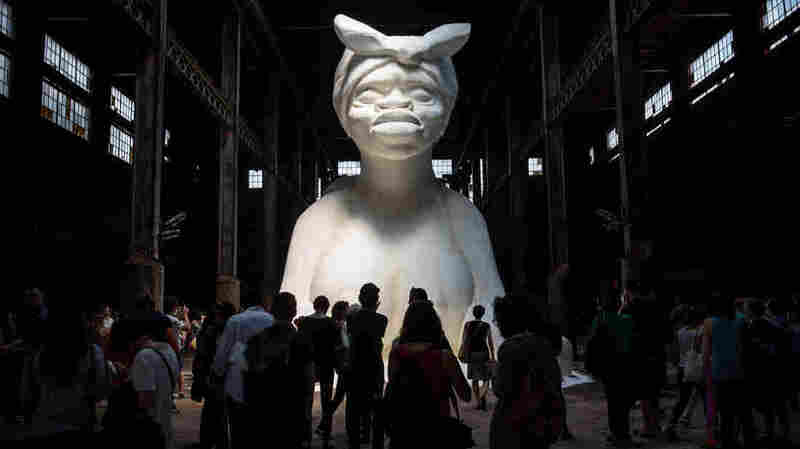 Kara Walker's A Subtlety stretches 75.5 feet long, 35.5 feet tall and 26 feet wide. To understand where all this is going, you need look no further than Walker's teasingly long title for the show: "A Subtlety or the Marvelous Sugar Baby an Homage to the unpaid and overworked Artisans who have refined our Sweet tastes from the cane fields to the Kitchens of the New World on the Occasion of the demolition of the Domino Sugar Refining Plant." I know, it's a mouthful. But Walker has this wide smile and as she sweeps her hands around in broad gestures, white tides of sugar dust ripple at the edge of her feet — and she sells it. "It was very fun and childlike to, you know, have your hands in a bucket full of sugar, or a 50-pound bag of sugar, throwing it out onto the floor," she says. 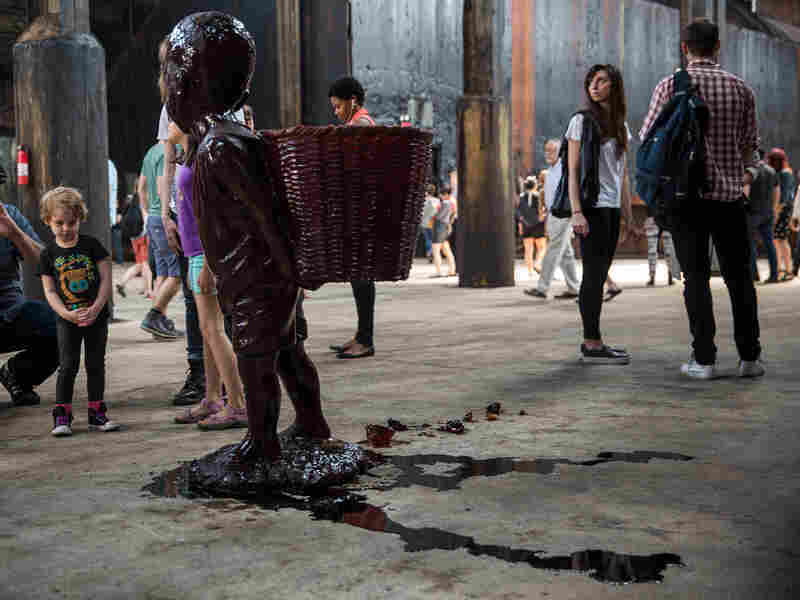 Walker's candy boy sculptures started melting fast in the non-climate-controlled factory, and the result looks a lot like blood. She's doing what she does best: drawing you in with something sweet, something almost charming, before you realize you've admired something disturbing. In this case, that's the horror-riddled Caribbean slave trade that helped fuel the industrial gains of the 18th and 19th centuries; a slave trade built to profit from an insatiable Western market for refined sugar treats and rum. "Basically, it was blood sugar," Walker says. "Like we talk about blood diamonds today, there were pamphlets saying this sugar has blood on its hands." "I've been kind of back and forth with my reverence for sugar," Walker says. "Like, how we're all kind of invested in its production without really realizing just what goes into it; how much chemistry goes into extracting whiteness from the sugar cane." Walker went down a rabbit hole of sugar history, at one point stumbling on some black figurines online — the type of racial tchotchkes that turn up in a sea of mammy cookie jars. They were ceramic, brown-skinned boys carrying baskets. Those were the size of dolls, but Walker's are 5 feet high, some made entirely of molasses-colored candy. Fifteen of them are posed throughout the factory floor, leading the way to her sugar sphinx. The boys are cute and apple-cheeked, but they're also kind of scary — some of the melted candy looks a lot like blood. The candy sculptures have been disintegrating so fast that Walker began throwing pieces of the broken boys into the baskets of the ones that are still standing. "I knew that the candy ones wouldn't last," Walker says. "That was part of the point was that they were going to be in this non-climate-controlled space, slowly melting away and disintegrating. But what's happened is we lost two of these guys in the last two days or so." Losing those figures in service of the sugar is the slave trade in a nutshell. "Also in a nutshell," Walker says, "and maybe a little bit hammer-over-the-head, is that some of the pieces of the broken boys I threw into the baskets of the unbroken boys." 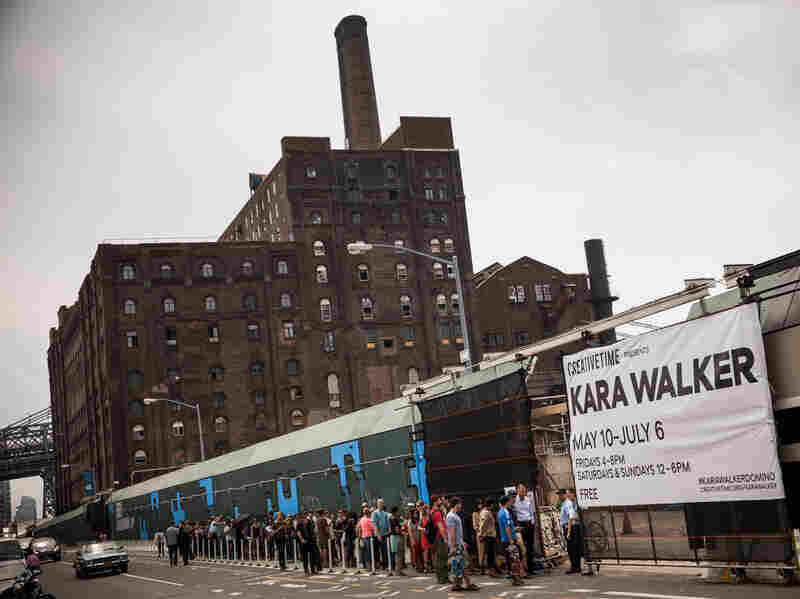 OK, that's not so subtle, but it's also not unusual for Kara Walker. She's dressed in a shiny, oversize baseball jacket emblazoned with the gold face of King Tut on it. I ask her if at a certain point she worries about doing work that is seen as being just about race. "I don't really see it as just about race," she says. "I mean, I think that my work is about trying to get a grasp on history. I mean, I guess it's just kind of a trap, in a way, that I decided to set my foot into early on, which is the trap of race — to say that it's about race when it's kind of about this larger concern about being." I tell her it's almost impossible to talk about our history without talking about race. She replies: "There [are] scholarly conversations about race and then there's the kind of meaty, unresolved, mucky blood lust of talking about race where I always feel like the conversation is inconclusive." Inconclusive, but for artist Kara Walker, ongoing.